Recent years have seen a dramatic increase in anti-Semitism in Europe. 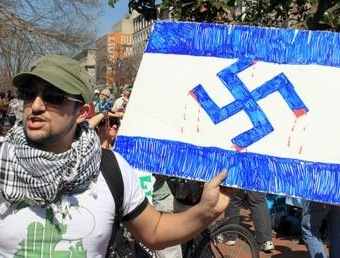 In the United States, too, anti-Semitism is on the rise. In some cases, it comes in the familiar age-old guise of hatred of Jews, plain and simple; but in many others, it is cloaked in the form of the negation of Zionism, or in other words, the denial of Israel’s right to exist as a Jewish state. In her recent New York Times article, “Anti-Zionism Isn’t the Same as Anti-Semitism,” Michelle Goldberg claims that the two are, in fact, very different stances. Using a convoluted argument, based on the historical opposition to Zionism among some Jews, and on the fact that Israel’s policies toward the Palestinians can make it hard for others to identify with the state, she tries to prove that it is possible to be anti-Zionist without necessarily being anti-Semitic. She argues that because Jews around the world have very different interests, which can sometimes clash with those of the State of Israel, then anti-Zionism is merely opposition to the Jewish state, and has nothing to do with one’s attitudes toward Jews per se. This argument is misleading, at best; a less generous analysis is that it willfully ignores the realities of anti-Zionism, and is prepared to leave it to the Jewish state to pay the price. According to reports produced by various research institutes, the Israeli government, and Jewish organizations in Europe, the number of attacks on Jews is rising constantly, and the sense of personal security felt by Jews in major European countries is on the wane. In the United States, too, anti-Semitism is increasingly apparent. Contemporary European anti-Semitism includes both “traditional” European Jew hatred as well hatred directed at Zionism and the State of Israel, including calls for Israel’s destruction. Thus, at various demonstrations, events, and anti-Semitic incidents, “traditional” expressions of hatred against Jews can be heard alongside the vilification of Zionism and the Jewish state. Continue Reading…. Tired of seeing anti Zionism comments and cartoons. Some of the people doing it claim there is a difference between Zion and Zionism as if people like King David were not very much Zionists. Of course these are the same people who often claim Jews living in Israel are not real Jews, and have no right to the land. They serve as mouth pieces for the left and those nations seeking the demise of Israel.